Prince William and Kate Middleton were on Friday pronounced man and wife at the majestic Westminster Abbey in London where the couple exchanged vows in the presence of some 1,900 guests, while millions of people around the world watched the ceremony live on TV. 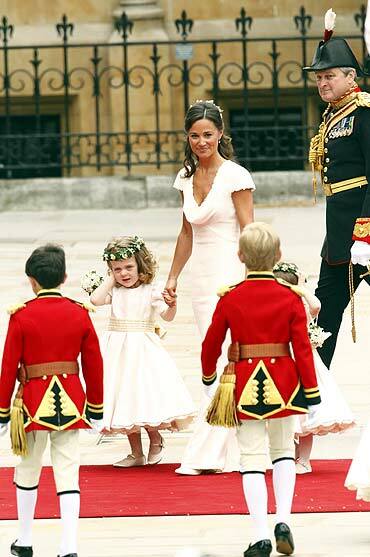 Middleton, 29, wore an ivory and lace gown designed by Sarah Burton at Alexander McQueen, while the prince, 28, was attired in the red tunic of an Irish Guards Colonel -- his most senior honorary appointment. Prince William, the second in line to the British throne, has been given the title of the Duke of Cambridge by the Queen, and Middleton has become Her Royal Highness the Duchess of Cambridge on their marriage. 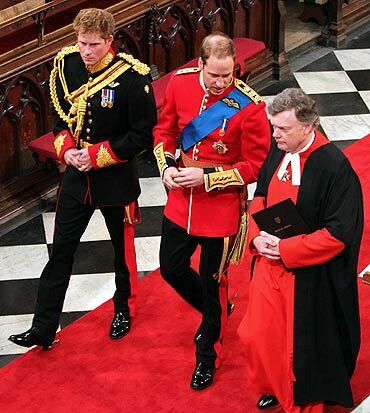 The Prince has also become the Earl of Strathearn and Baron Carrickfergus, which means Middleton will become the Countess of Strathearn and Baroness Carrickfergus. 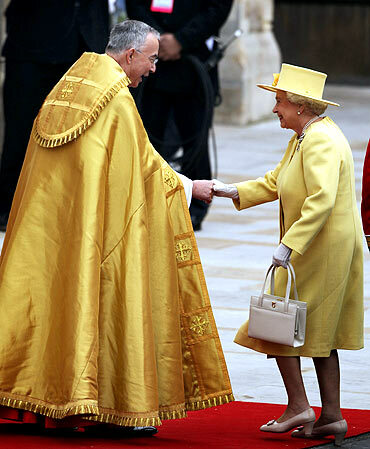 The couple were pronounced man and wife by the Archbishop of Canterbury Rowan Williams. 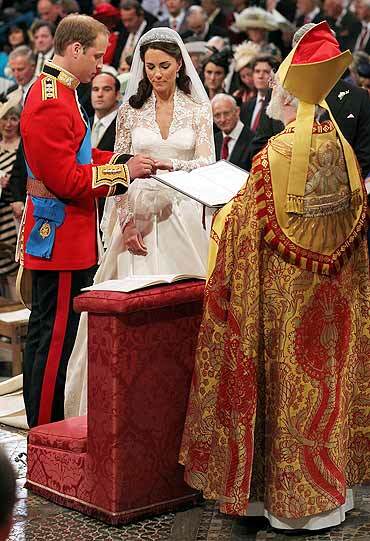 William and Kate had written their own prayer: "God our Father, we thank you for our families; for the love that we share and for the joy of our marriage. "In the busyness of each day keep our eyes fixed on what is real and important in life and help us to be generous with our time and love and energy. Strengthened by our union help us to serve and comfort those who suffer. We ask this in the Spirit of Jesus Christ. Amen". Hundreds of thousands of people converged in London from all over the world for the royal wedding. Thousands of street parties have been planned across Britain to celebrate the royal wedding. 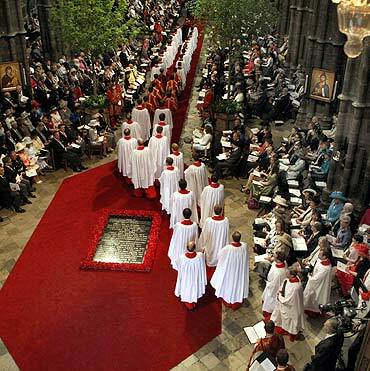 Image: General view in Westminster Abbey before the royal wedding. "We are both so delighted that you are able to join us in celebrating what we hope will be one of the happiest days of our lives. The affection shown to us by so many people during our engagement has been incredibly moving, and has touched us both deeply." 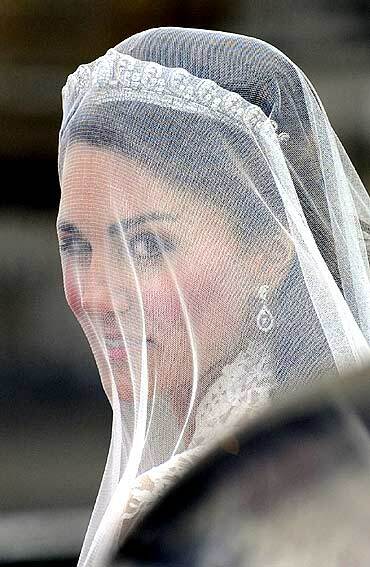 Invitees to the wedding included royal families from various countries, political leaders and people of different walks of life, including an Indian-origin shopkeeper couple from Kate's village of Buckleberry. 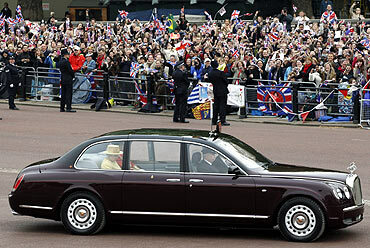 Among the hundreds of guests at Westminster Abbey were soccer star David Beckham and his 'Spice Girl' wife Victoria. Image: Members of the public line the Procession Route ahead of the wedding between Britain's Prince William and Kate Middleton at Westminster Abbey, in central London. Chelsy Davy, Prince Harry's on-again-off-again girlfriend, was also present. US President Barack Obama was not on the guest list. Britain's former prime ministers Tony Blair and Gordon Brown were also not invited. Prince William and commoner Kate spent their last night as singles, with the Prince delighting people who had camped for days by shaking hands with them last night. "All I've got to do is get the lines right", he quipped as he easily mixed with cheering crowds in The Mall. 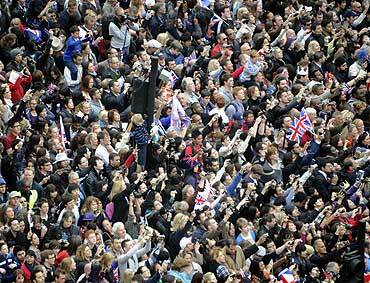 Hundreds of thousands of people have converged on London from all over the world to attend the royal wedding. 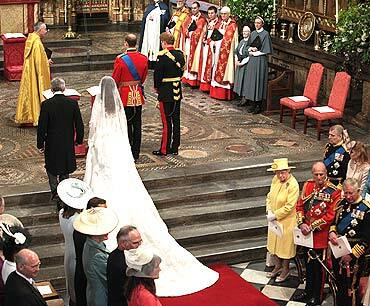 The wedding ceremony in the ancient Westminster Abbey was scheduled for 3.30 pm. Thousands of street parties have been planned across Britain to celebrate the first wedding of Queen Elizabeth's grand-children. 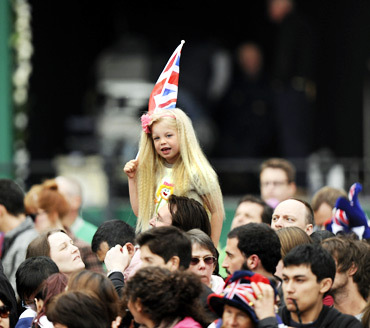 Since early morning, major television channels began their live coverage amid largely clear skies and thousands of excited fans of the royal family. Image: A girl with a British flag smiles among people gathered outside Buckingham Palace before the wedding of Britain's Prince William and Kate Middleton at Westminister Abbey. 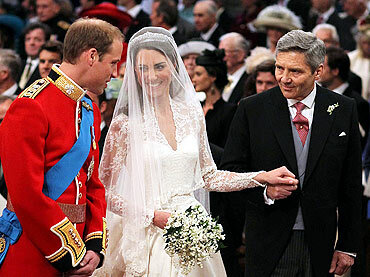 First look: Wills' and Kate's wedding ensembles! 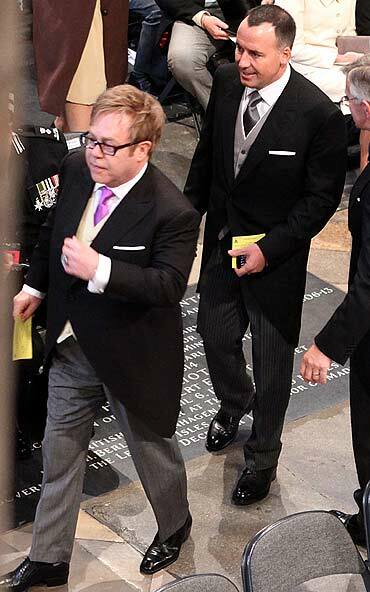 PIX: Beckhams, Cameron et al attend Royal Wedding!